On Sunday morning my family woke up fresh and ready for the day! 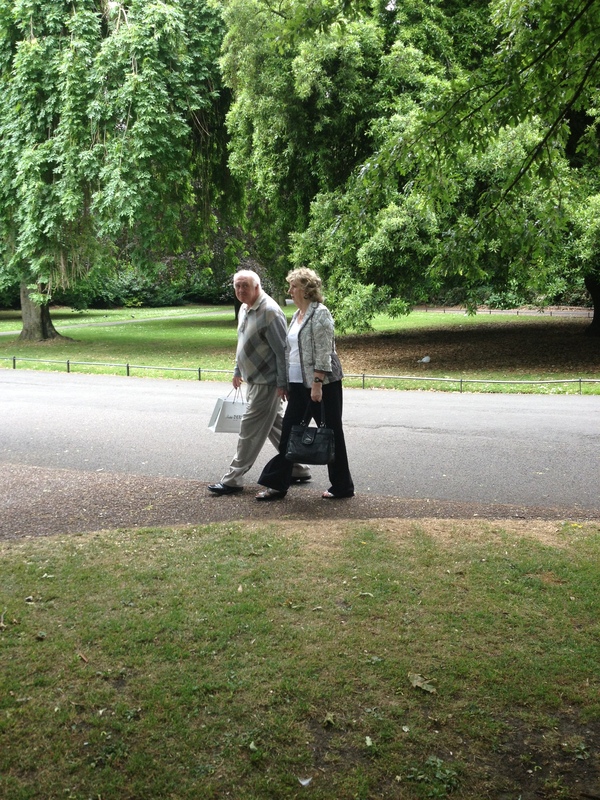 ….Well, better than before anyways.. We walked down to Dublin City Hall around 11 am for our free walking tour. 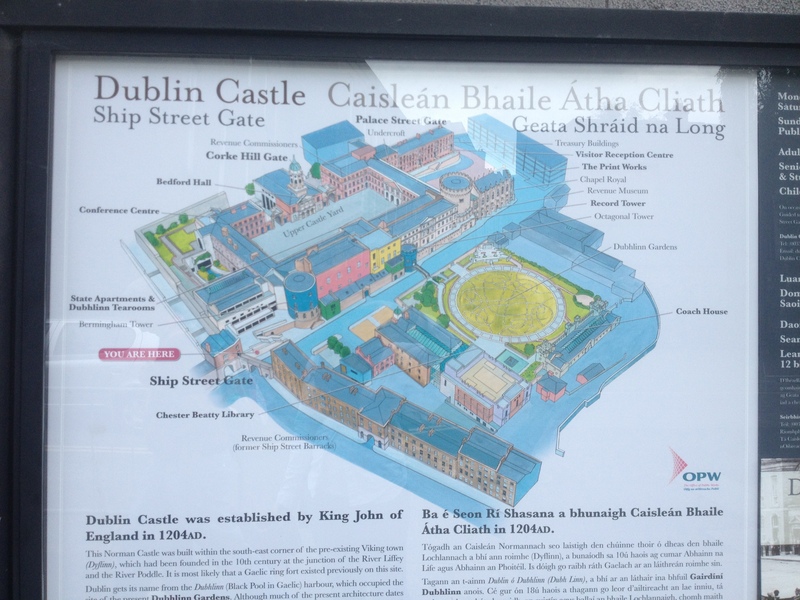 After some initial confusion with grouping and tour guides, we were off to learn about the historical sites and landmarks of Dublin city. 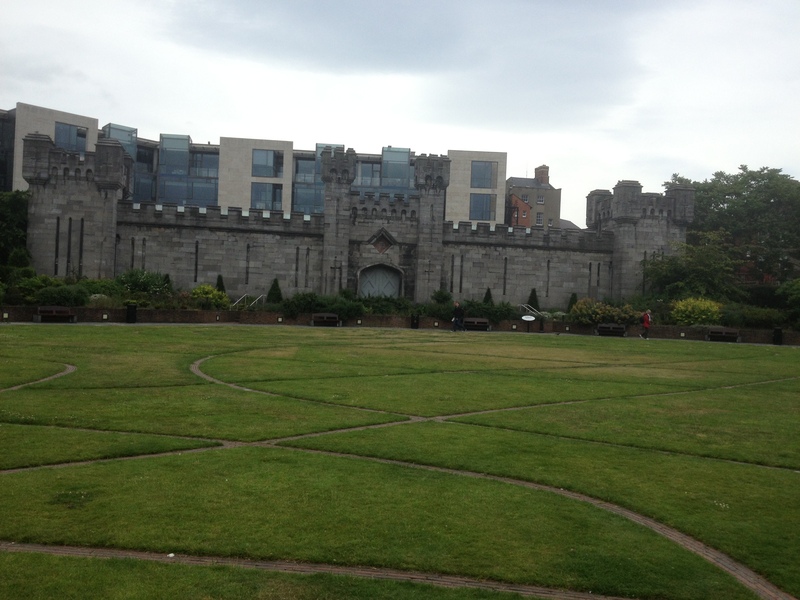 Our first stop was the Dublin Castle, specifically the Dubh Linn garden and the Coach House. The black pool of water that the garden once was, used to run into the Liffey river. It is named such because the Irish word for black is ”dubh” and the word for pool is “linn”. 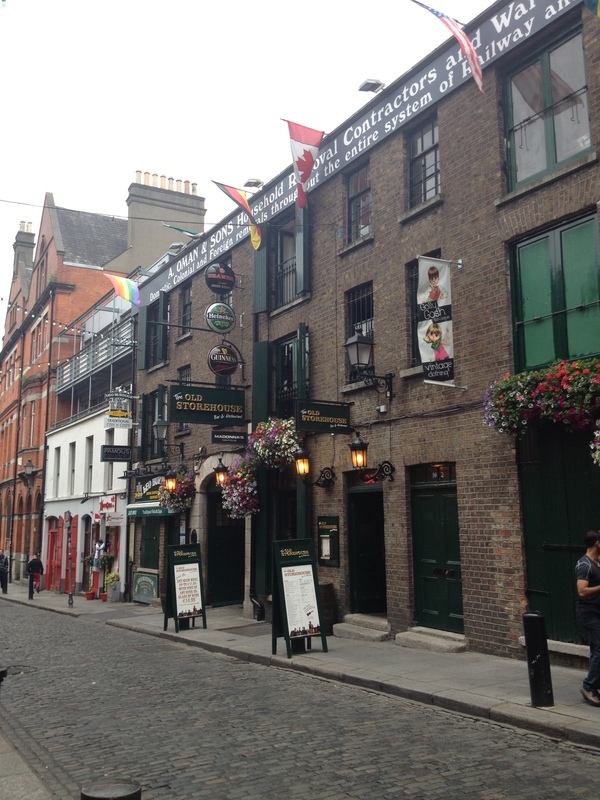 Hence Dubh Linn, which also sounds a LOT like Dublin… Merely a coincidence though I’m sure. 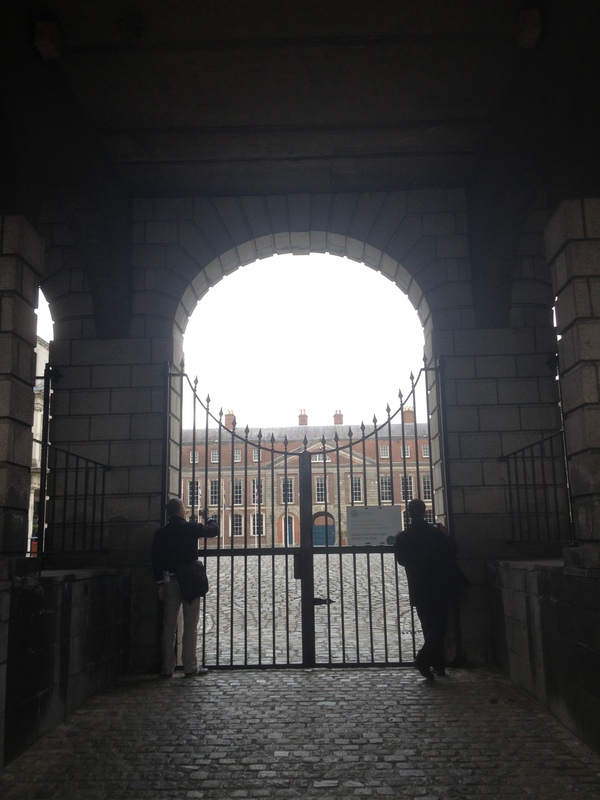 Turning to look back at the actual Dublin Castle, our tour guide explained to us the various reconstructions and different sections of the castle. It was originally built in the 13th century, but was rebuilt in the 17th, 18th, 19th and 20th centuries. As you can tell from the photograph, it is very un-uniform and mismatched. -The South East Record Tower is the only remaining intact piece of the medieval castle. It was used as a high security prison tower, which makes sense since the walls were 4.6 meters thick (about 15 feet). -Chapel Royal on the far right, was built in the 1800s as the official Church of Ireland chapel of the Household of the Lord Lieutenant of Ireland in 1814. -The middle three storied section of classical stone facade are the State Apartments, which were renovated in 1700s. They are now used by Irish Government for official business. -The colourful buildings on the far left are a continuation of the State Apartments. They were stuccoed and painted the bright colours by the Office of Public Works. 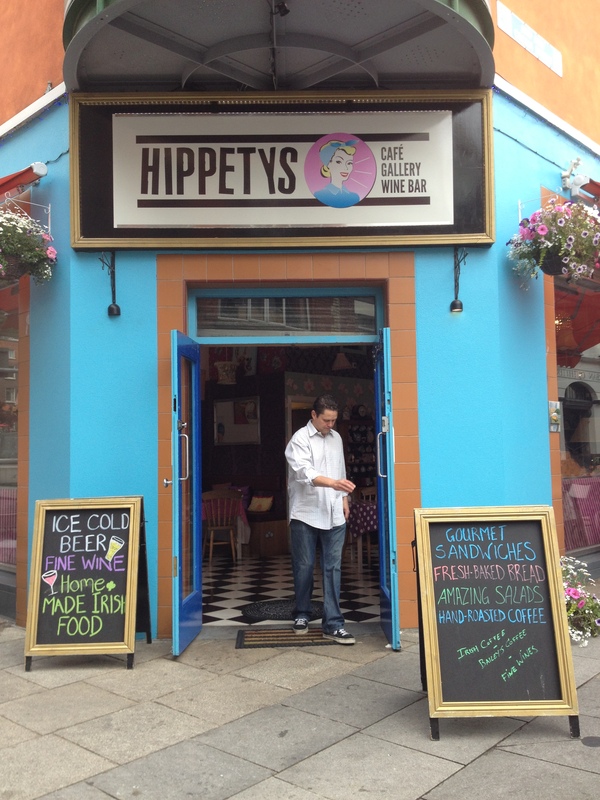 Nicknamed Lego Land by Dubliners, it is a very peculiar sight that is not exactly a local favourite. Other highlights of our tour were: traces of Viking remains, Christ’s Church Cathedral (aka the Whiskey church), Temple Bar area, Trinity College, the Famine Memorial, and St. Stephen’s Green. 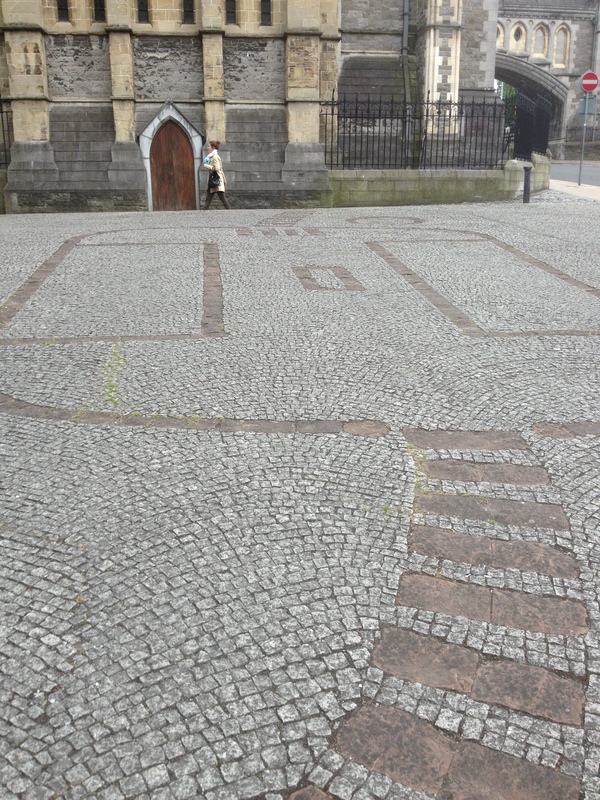 This is the stone outline of a Viking house that was unearthed in this area of the city. The two rectangular areas inside the house represented the sleeping quarters for the Vikings. Apparently a house this size would hold around 20 Viking men! Its hard to judge from the picture but the house was not big at all. Those guys would’ve had to sleep back to back to back, spooning all night long to fit in those spaces. Tight view of Christ Church Cathedral. 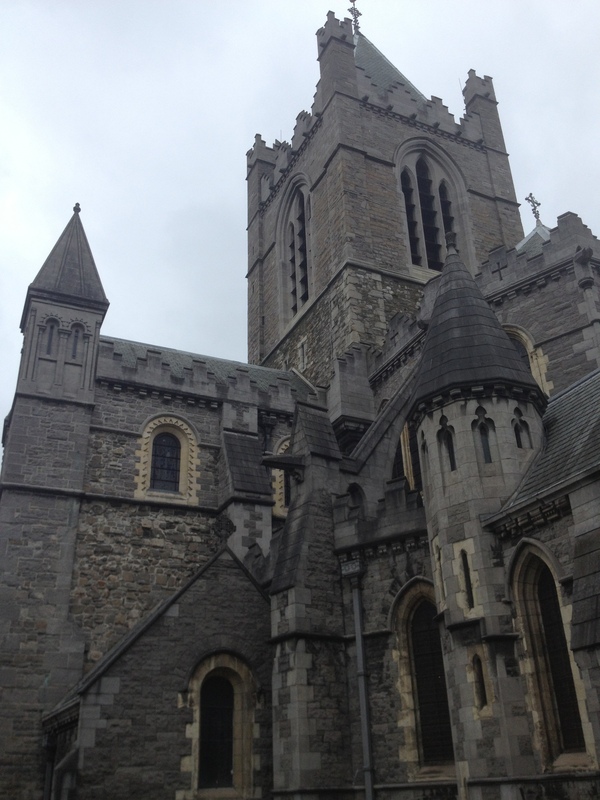 It was founded in 1028, but like so many buildings in Ireland, had to be rebuilt and renovated many times. In 1871, a Dublin whiskey distiller, Henry Roe, gave the equivalent of £23 million to save the cathedral. This is why the church earned its nickname as the “Whiskey Church”. 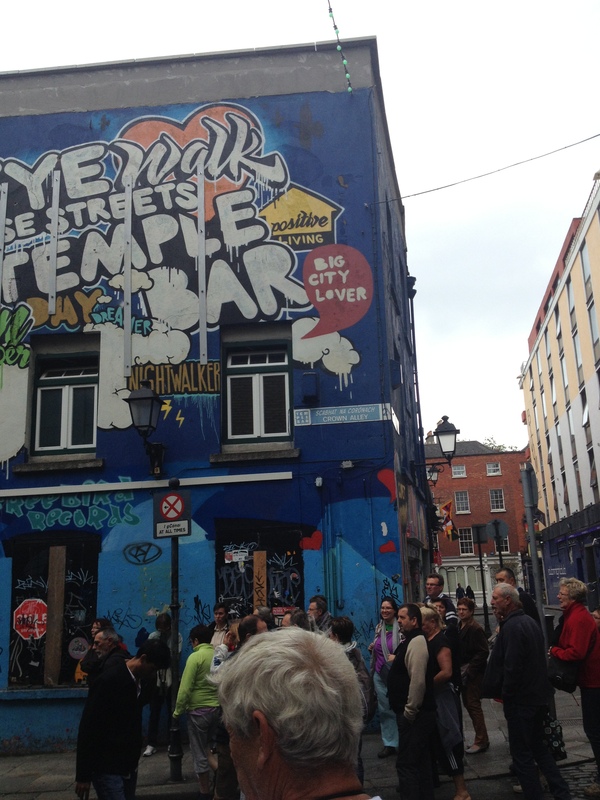 Temple Bar area, famous for its many bars and shops, is the popular spot for tourists and night life in Dublin. 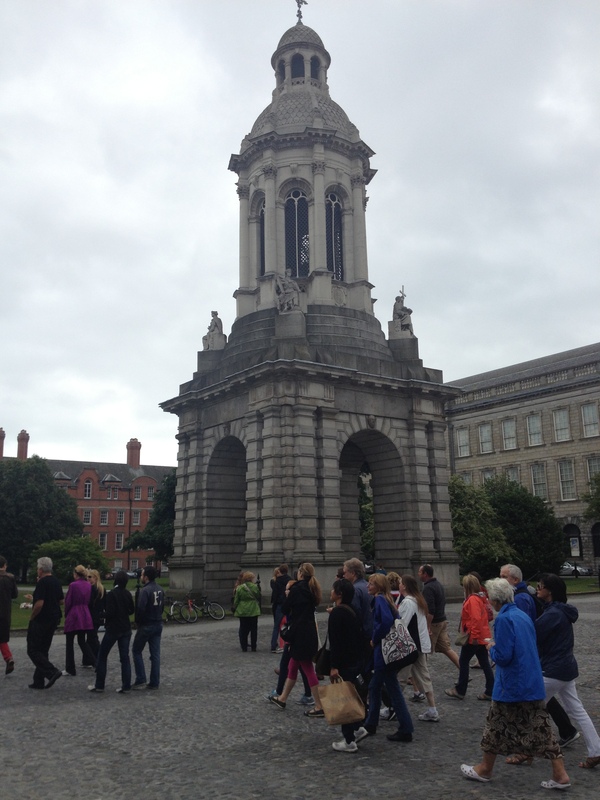 Below is the Campanile or bell tower of Trinity College. Our guide explained to us that if a student was able to climb to the very top of the Campanile, that they would be named King of Trinity, which would entitle them to various privileges. The headmaster of the college however, could stop the students from becoming the King, if they managed to shoot the climbing student with a crossbow from his window in the main building across the way. 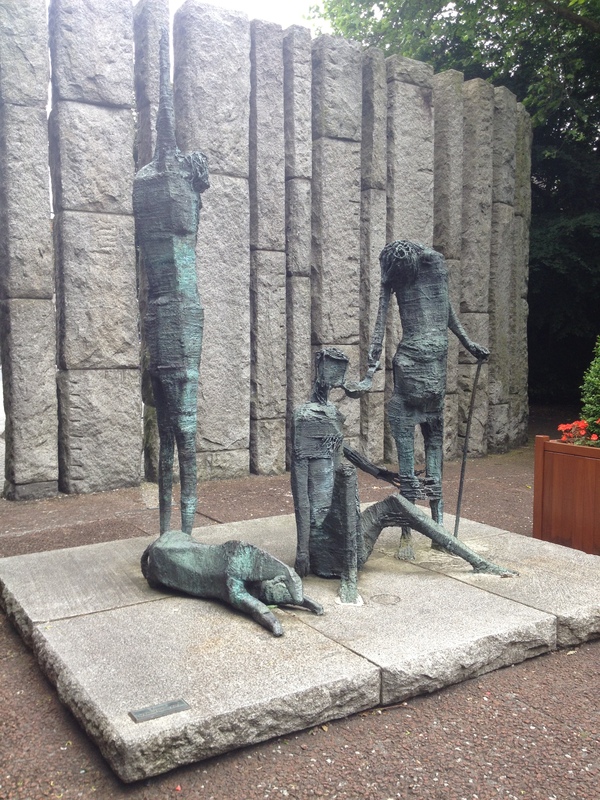 This sculpture is title “Famine”, created by Edward Delaney. It stands as a reminder of the Great Famine in Ireland between 1845 and 1852, when about one million people died and a million more had to leave Ireland for different countries. 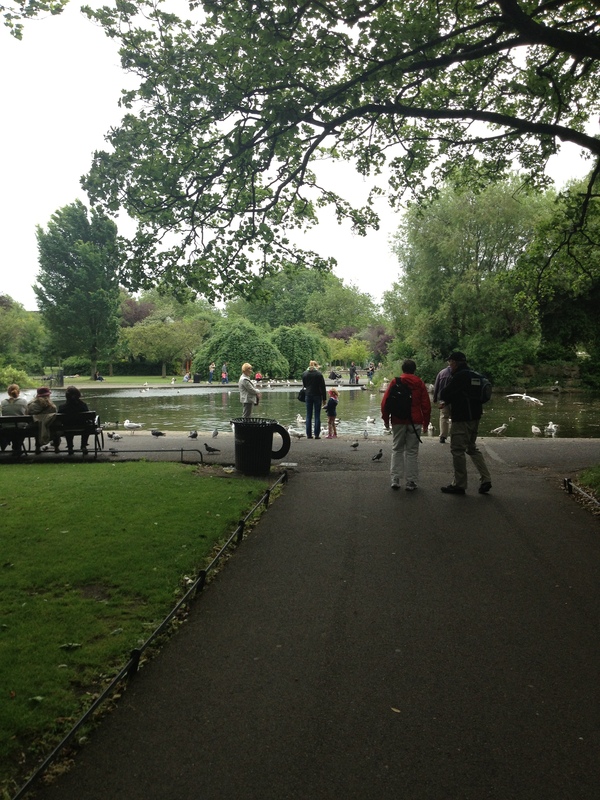 Lastly we ended our tour walking out through St. Stephen’s Green, the public park in Dublin. 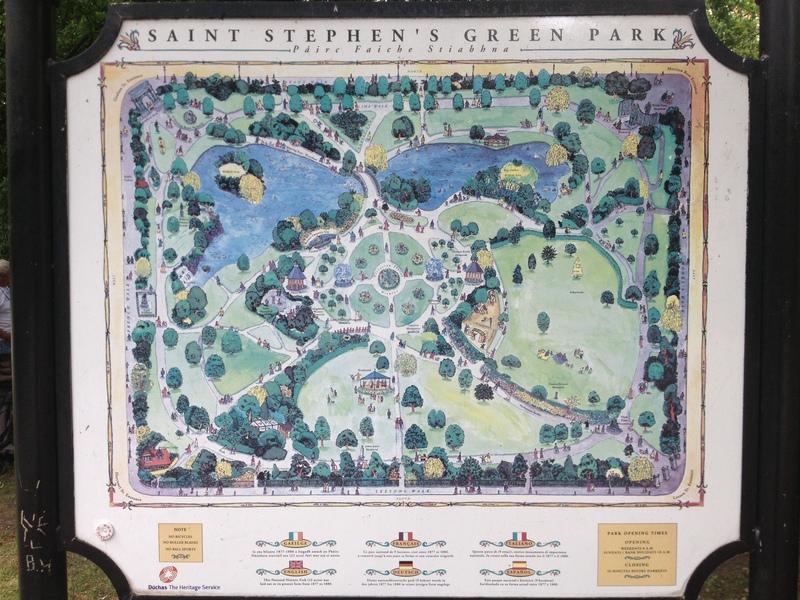 It is similar to the Boston Commons, with many rows of trees, maintained grass, and even a duck pond and gazebo. 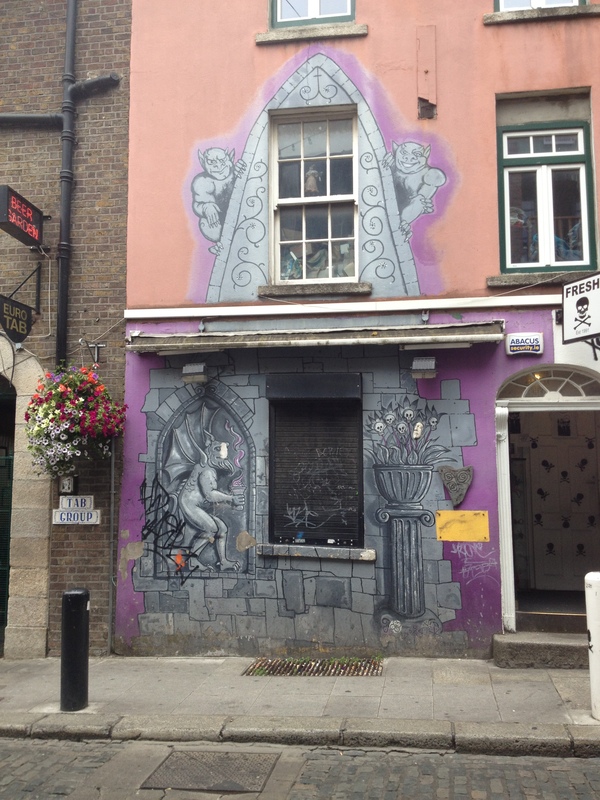 For anyone in Dublin or going to visit, I would definitely recommend the Sandemans New Europe tours. They offer free walking tours, which is what we did, so if you don’t like it you didn’t loose any money, just a few hours of your life in a foreign country that you will never get back!